Trucks of the 40th Russian Ministry of Emergency Situations convoy with humanitarian aid for Donabass residents have reached Lugansk. 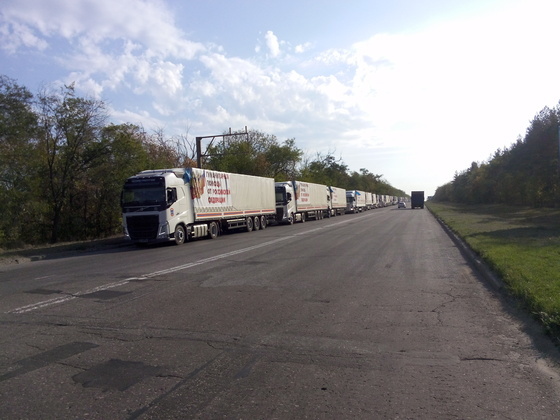 45 trucks of the convoy have delivered approximately 385 tons of humanitarian aid, according to the official Lugansk People’s Republic State Reserves Agency’s representative. The aid includes 24 tons of medical supplies, 12 tons of oatmeal, 110 tons of canned milk products, 79 tons of sugar, 65 tons of macaroni products, 12 tons of canned meat, 98 tons of canned fish, 150 kg of tea. This entry was posted in News from Ukraine and tagged Humanitarian aid, LPR, Lugansk, Russia. Bookmark the permalink.